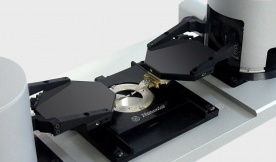 Providing up to four AFM systems in one, the MultiView 4000 system is a novel platform for the most advanced experiments in nanoscale transport, optical pump-probe, and read-write lithography. Multiple probe operation enables non-destructive characterization, manipulation, and measurement of electrical, thermal, and optical properties of materials and electronic devices. Operation with up to four probes simultaneously and independently, the MV 4000 is a nanoscale probe station with feedback and scanning capabilities. The MV 4000 continues the tradition of the MV series of providing total optical flexibility and customization possibilities so that now AFM Raman and tip enhanced Raman spectroscopy (TERS) can be integrated with the multiprobe capability. Finally, free optical access from above allows easy visualization of all probes and facilitates nanomanipulation. This system offers unlimited possibilities in your research – contact us to discuss how you can take advantage of this revolutionary technology.